In 1993, at the age of 31, Victor Pelevin won the “Little Booker” Prize for short fiction for his volume of stories, The Blue Lantern. By 1994, his work was widely available in translation. In 1996, the New York Times first reviewed his novel, Omon Ra, a story that reinvigorates the Russian surreal style of Gogol or Platonov, depicting the absurd one-way journey of a Cosmonaut as he is efficiently disposed of by a bewildered Soviet regime. Since then, Pelevin has published three increasingly complex novels and two fantastic collections of short stories. So why haven’t you heard of Russia’s leading novelist?—because Victor Pelevin does not believe in progress. Like Borges and Calvino before him, Pelevin prefers the worlds he imagines to the one that exists, exchanging politically engaged, realistic narratives for labyrinthine surrealism that never forgets to interrogate itself. 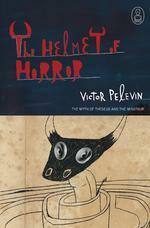 His newest book, The Helmet of Horror, cannot properly be called a novel, as it is the postmodern retelling—in the form of an internet chat room—of the ancient tale of Theseus and the Minotaur. The pages of this book are populated with “characters” who, like so much of what appears in the new media, might not exist at any level of reality. They are screen names, avatars, and, as Pelevin persistently reminds readers, epistemological and metaphysical uncertainties. After all, how could we fail to question the existence of others whom we know only by their assigned pseudonyms: Monstradamus, Ariadne, and Romeo-y-Cohiba? The foundation of this mind-set on progress is not faith, as happens with traditional cults, but the absence of it. However, the funny thing is that the concept of progress has been around for so long that now it has all the qualities of a myth. It is a traditional story that pretends to explain all natural and social phenomena. It is also a belief that is widespread and false. Pelevin argues that “The road away from myth is called ‘progress,’” and then comes down in favor of myth. But this short introduction, titled “Mythcellaneous,” is essentially the last time we hear Victor Pelevin’s authorial voice; like Dostoevsky, Pelevin manages to create autonomous characters and stringently refuses to judge them. The book begins with the problem of orientation: seven screen names encounter each other in a chat room and soon discover that they are all seated in front of a computer screen, each in his or her own room (“or a cell,” Romeo-y-Cohiba suggests) with two doors. When they try to tell each other personal information, the computer blocks the entry. The monitor is embedded in the wall and protected behind a thick sheet of Plexiglas, and the keyboards are tightly fastened. In each room, one of the doors opens into a bathroom, and one door is locked. Their first impression is that they might all be in the same hotel, in different rooms, as part of an elaborate scheme or experiment; however, they soon discover that the locked door opens into a vast labyrinth, and each of the avatars in the chat room sees something different outside of the room. Romeo-y-Cohiba: You talk about (Theseus) as if you’d seen him with your own eyes. But we don’t actually have any reason to believe he exists. Ariadne: What do you mean? Theseus or (the Minotaur)? Monstradamus: And for exactly the same reason, Romeo, there’s no reason to believe that you exist. It is Pelevin’s style and humor, not his occasional philosophical disquisitions, that will keep readers engaged. The insistence on the internet chat room as the structure of the book allows Pelevin to avoid the trappings of identity politics without playing the reactionary. But his techno-transcendentalism might be too much (or not enough?) for some readers. People who managed to enjoy Robert M. Pirsig’s digressions on contemporary philosophy in Zen and the Art of Motorcycle Maintenance will be deeply satisfied by Pelevin’s own inquiry into values. The chat room dialogue form does not allow for scene summaries or other authorial interventions, and the result is an emphasis on ideas instead of character development. How Russian.